L 100-115 cm, WS 250-285 cm. Very rare, until recently having declined markedly (in Europe 1000+ pairs remain, most of them in Spain). Breeds both in arid, wild mountains and in vast lowland forests with hills or rocky outcrops. Food mainly carrion. Nest almost invariably in tree, a huge eyrie of branches and twigs. IDENTIFICATION: Huge, on average somewhat larger than Griffon Vulture. As with Griffon, size of distant soaring bird apparent mostly by slow-motion-like movements. Wings broad with very long ‘fingers’. The flight silhouette is more eagle-like than in Griffon owing to more evenly broad wings, more apparent head (due mainly to dark colour) and all-dark plumage. Tips of secondaries pointed, giving saw-toothed trailing edge. Confusion with an eagle prevented by the smaller head in comparison with the huge wings; also, the outer wings are more deeply ‘fingered’, and the outermost two primaries flex upwards more prominently than on eagles. When soaring, now and then takes a single, deep, ‘embracing’ wingbeat (cf. Griffon; virtually never seen from eagles). Tail short as on Griffon Vulture, rounded or slightly wedge-shaped. Active flight heavy, wingbeats deep and slow. Head-on silhouette when soaring significantly different from Griffon in that inner wings invariably are held flat, with primaries slightly lowered. 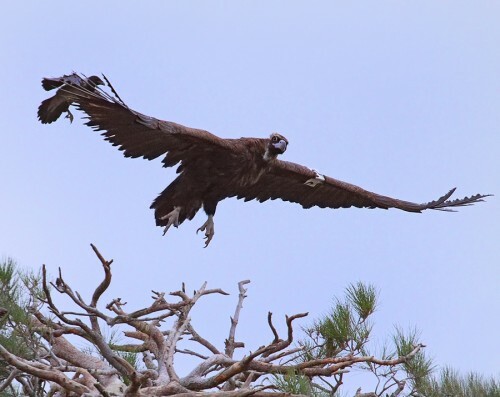 Unlike other large, broad-winged vultures, glides in to land without dangling legs; instead, often holds tail up. Colour of feet variable: bluish grey-white, pale pinkish, pale yellowish. - Adult: Underwing-coverts not uniformly dark but show some paler grey-brown on lesser and median (generally forming one or two diffuse bands). Also, ruff and head are pale brownish, not blackish as on juvenile. - Juvenile: Underwing-coverts uniformly black, darker than the flight-feathers. Head and ruff, too, are blackish, not lighter brown as on adult. The adult plumage is acquired over a period of c. 6 years.